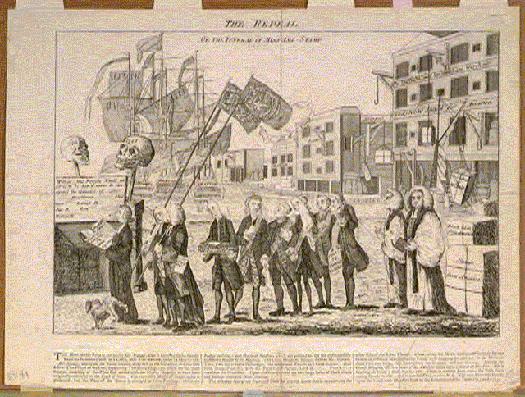 This satirical print published March 18, 1766 in London and attributed to Benjamin Wilson depicts a mock funeral procession composed of supporters of the Stamp Act carrying a small coffin containing the remains of the bill toward an open burial vault. "George Stamp" in the foreground represents Lord George Grenville, considered to be the author of the Stamp Act in his position as First Lord of the Treasury. Grenville is shown "carrying his favourite Childs Coffin, Miss Americ Stamp, who was born in 1763 and died hard in 1766." At the head of the procession under the name "Anti-Sejanus" preparing to deliver the funeral eulogy is the Reverend W. Scott, who under the pseudonym "Anti-Sejanus" published letters in support of the Stamp Act in London's Public Advertiser. "Anti-Sejanus" Scott is followed by the mourners Solicitor General Alexander Wedderburn and Attorney General William Norton, who are sarcastically labeled in the text as "Two Pillars of the Law". Mourners following "George Stamp" Grenville are Lord John Bute, the Duke of Bedford, and Sir William Temple, who supported Grenville in getting Parliament to pass the act on March 22, 1765. The new law required colonists in America to pay a tax on every piece of printed paper they used, including legal documents, licenses, newspapers, ship documents and other publications. Revenues raised by the Stamp Act were used to help pay the costs of defending and protecting the American frontier near the Appalachian Mountains, with plans for stationing some 10,000 troops. Although the tax rate was relatively modest, the Act sparked widespread opposition as many colonists disputed the principle that the British government had a right to impose internal taxation without any colonial representation in Parliament. The drawing by Wilson depicts the procession on a dock, showing large unshipped cargoes intended for America that had remained during the period when the act was in force resulting from the boycott begun by many colonists in protest of goods covered by the tax . Ships labeled "Conway," "Rockingham," and "Grafton," representing the Parliamentary leaders responsible for the repeal of the bill are shown ready to carry the goods to America. The wharf is shown stacked with stamps just returned from America. Above the vault, the dates on the skulls refer to the uprisings by the Jacobites, supporters of King James after the Glorious Revolution of 1688 who continued to believe that the authority of the king was derived from divine right and not from Parliament. The black flags carried by Wederburn and Norton contain the numbers 71 and 122 which refers to the number of votes against the repeal of the Stamp Act in the houses of Lords and Commons. The Repeal quickly became “the most popular satirical print ever issued” according to one scholar. Within three days the publisher issued an advertisement requesting patience by customers since he could not keep up with the demand for copies. Within the week other print sellers were issuing their own versions of Wilson’s drawwing, undercutting the market for the original. Later versions adding color to the print also were published. Within this Family Vault, Lie Interred, it is to be hoped never to rise again, The Star Chamber Court Ship Money Excise Money & all Imposts without Parliament. The Act de Haeritico Comburendo Hearth Mon Gener Warrants And which tended to alienate the Affections of Englishmen to their Country. Over the Vault are placed two Skeleton Heads. Their elevation on Poles, and the dates of the two Rebellion Years, sufficiently shew what Party they espoused, and in what cause they suffered an ignominious Exit. 2nd column:is changed to three farthings, an important sum taken from the Budget. The numbers 122 and 71 declare the minority which fought under these Banners.
. Among these is a large Case containing the Statue of Mr. Pitt, which is heaving on board a Boat No. 250, there is another boat taking in goods nearer the first Rates, which is No. 105. These Numbers will ever be held in esteem by the true SONS of LIBERTY. This cartoon, which celebrates the end of the Stamp Tax, is said to be "one of the most famous and popular of the political satires commenting on the Stamp Act." This print became one of the most copied satirical prints of the time period. Leading the procession and preparing to deliver the funeral eulogy is the Reverend W. Scott, who under the name "Anti-Sejanus," published letters in support of the Stamp Act in London's Public Advertiser. The dates on the skulls above the vault refer to the uprisings by the Jacobites, supporters of King James after the Glorious Revolution of 1688. They continued to believe that the authority of the king came from God not Parliament.The black flags carried by Wederburn and Norton contain the numbers 71 and 122 which reference the number of votes against the repeal of the Stamp Act in the house of Lords and Commons.The ships in the background are labeled "Conway," "Rockingham," and "Grafton." They represent the Parliamentary leaders responsible for the repeal of the bill now stand ready to carry the goods to America. A small dog makes a gesture under Reverend Scott.Stamps just returned from America are also stacked on the wharf. Directly behind the bale of stamps, is a crate containing a statue of William Pitt, Grenville's archenemy in the Stamp Act controversy.